Spring, like pregnant mares, doesn’t read a calendar. No matter what the calendar says, there is generally a day in the Bluegrass when you just know that Spring has finally come. This year, it was a glorious Sunday (aka March 17) when we’d had a couple of warm days the week before. On that day, the sun was shining and there was just a beautiful spring smell in the air. The grass was beginning to green thanks to the warm days that week, and maybe that’s what created the beautiful smell. It’s hard to describe, but when it comes, it fills your heart. And this year, we were blessed on that particular day to be celebrating the arrival of three foals in six days the week before. Icing on the cake. Jimmy Creed colt out of Suzy Malibu. Her colt by Jimmy Creed was anxious to throw his long legs around in a few attempts to get up, and he did spring up all by himself in just 35 minutes. He didn’t stay up long but then he got up again and immediately figured out nursing. He appears to have a voracious appetite! After about an hour, he finally laid back down and took a nap. As you can see, he’s such a cutie. 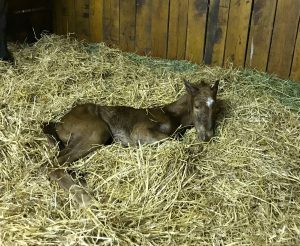 Miss Dixie Rose colt by Tonalist, once he finally laid down for a bit! Miss Dixie Rose was next. If you remember from the last blog, Miss Dixie was “due” on February 14. Yes, that’s right… she went WAY past her due date. 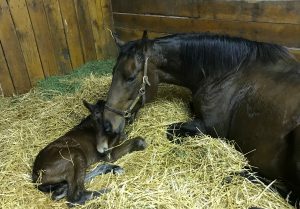 She delivered on her 366th day of carrying this colt!! 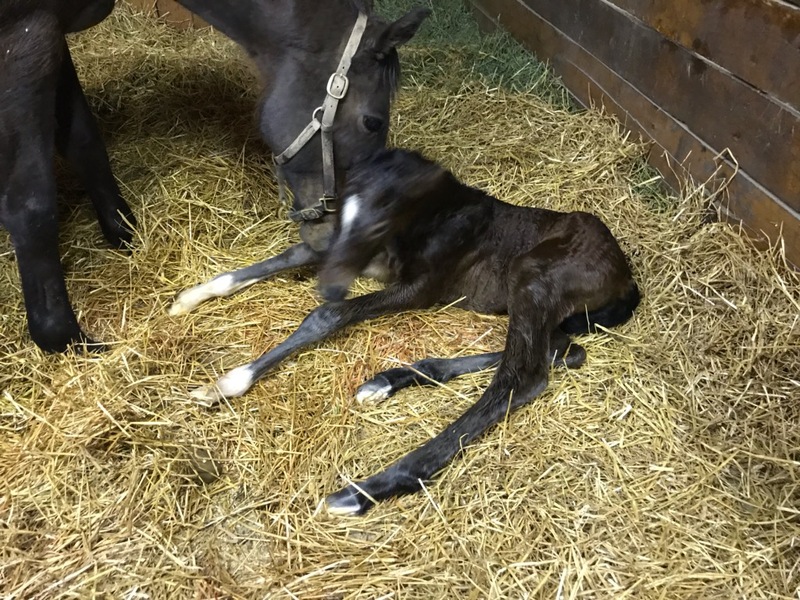 After a long, long labor she delivered a 118-pound colt by Tonalist. She might have wanted to keep him tucked away in her belly, but he was more than ready to enter the world. He came out kicking and got his legs under him within twenty minutes. Dixie was content to lay and rest awhile, even though the colt was up and strutting around the stall. Once she was up and nuzzling him (as much as he would allow), he was all about nursing. Good thing Dixie is such a patient momma, as she tolerated this rambunctious colt without even getting impatient. 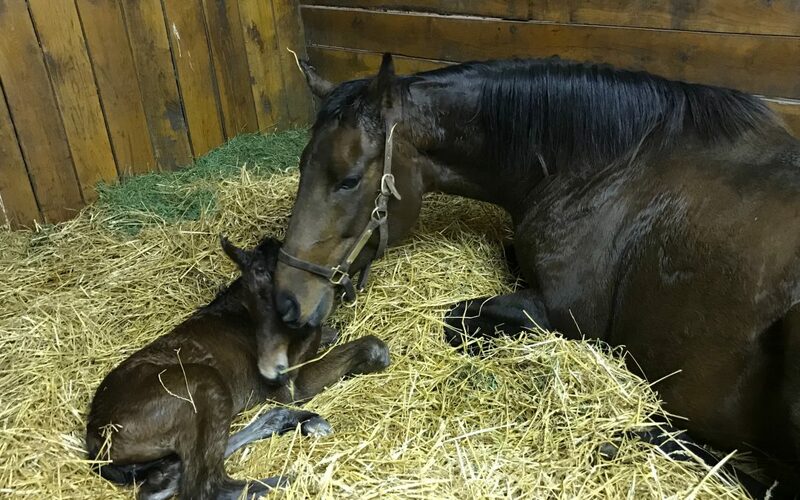 Two days later, on March 14, Caradini delivered a beautiful 119 pound filly by Goldencents. I don’t think I’ve mentioned that Caradini’s half-brother, SOMETHING AWESOME, became a Grade 2 stakes winner and a millionaire in the last year. So that’s pretty neat. Caradini and her Goldencents filly. You might remember that last year Caradini delivered her first foal – a colt by Goldencents – on Goldencents’ actual birthdate of March 7. I love coincidences and her “due date” was March 5, so we watched with anticipation wondering if she might do that again. But she foaled a week, to the day, later. Caradini’s gal was a typical filly. After loving with her momma a few minutes, she was squirming around the stall and up within 20 minutes. Click Here to watch the video. I hope the video works so you can see how she wasn’t too stable. Sweet Caradini, even while being milked to preserve her colostrum for her baby, helped her keep her balance. Watching how these mommas love on their babies, and help them to balance and nurse… and watching them outside when the foal can’t keep up, the mare will slow down to the pace that suits the foal… Well, there are days I wish I could just watch them all day long. BY MY STANDARDS winning the $1 million Louisiana Derby. A week after all that excitement, we had even more. 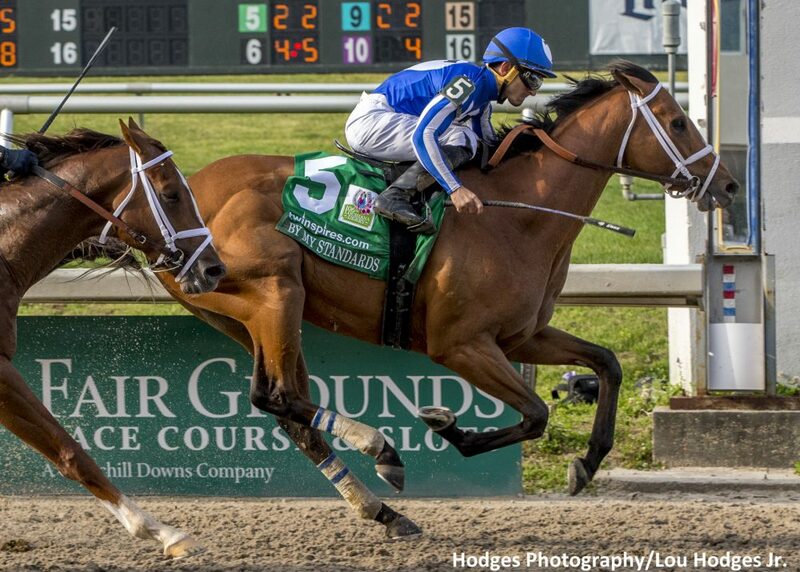 Goldencents’ son BY MY STANDARDS won the $1,000,000 Louisiana Derby-G2. By doing so, he earned 100 qualifying points for the Kentucky Derby and assured himself a spot in the Derby!!! By My Standards is from the first crop of Goldencents, and Goldencents was from the first crop of Into Mischief. What are the chances that a horse (Into Mischief) has a Kentucky Derby horse (Goldencents) from his first crop, who goes on to sire a (hopefully) Kentucky Derby horse from his first crop??? I’ve got to think the folks at Spendthrift (who stand both Into Mischief and Goldencents) are pretty excited. By My Standards went straight from winning a maiden special to this million dollar race. He laid just off the pace and slipped through when a hole opened up and earned a 102 speed rating — tied for the fastest of any speed rating run this year by a 3-year-old in the Kentucky Derby Pool. We’re proud and we’re pumped! 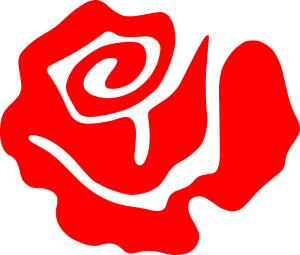 I love all the. mama’s and their babies at your farm. So darn adorable. I’m sure it’s hard to have to get back to errands and daily life. Easy to watch them and marvel at their beauty. My two favorites are in the Derby. so far. Omaha Beach and By My Standards. I did not realize at first Goldencents was his Pops but oh my, he ran a great race. I just want them to all to be safe and stay healthy. I am so concerned about Santa Anita and their races Thursday thru Sunday. I hope all horses and riders will be ok. Thank you for the photos and your article. What a great bunch of babies! And, exciting stuff with By My Standards headed to the Kentucky Derby! Thanks so much for sharing all of this wonderful news!!!! I hope to see you in May!! !